The oral narration of Dastan-e-Amir Hamza was a popular past time in most parts of Central, Western and South Asia and North Africa since medieval times. 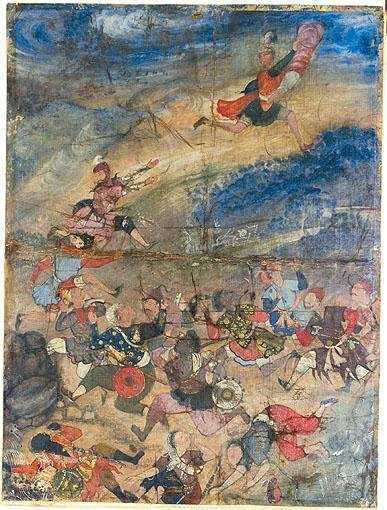 Originally composed in Persian, the Dastan-e-Amir Hamza describes the battles of Amir Hamza, the Prophet Muhammad’s Uncle, against infidels, sorcerers and other pretenders to divinity. Until the beginning of the twentieth century, the Dastan-e-Amir Hamza was singularly successful in entertaining a whole range of people, from the commoners at chauks and nukkads to the elites in their palaces; it was performed at the steps of the Jama Masjid where Dastangos gathered. While their neglect as literature is inexcusable, they have been wholly obliterated from the canon of performing arts. As anecdotes of Mir Baqar Ali, the last known Dastango of Delhi, testify, their performances required an exceptional command over rhetoric, delivery, mimicry, ventriloquism and spontaneous composition. The present performance of Dastangoi builds upon some recent shows that were enthusiastically received in the Capital. The performance consisted of portions of the best-known daftar, or chapter, of the 46 volume Dastan-e-Amir Hamza, the Tilism Hoshruba, the ‘Enchantment that Steals away the Senses’, which is itself in seven volumes. The performances have come about as a result of a collaboration between S.R. Faruqi, the foremost living authority on these Dastans and the only person to possess a full set of all the 46 volumes, and the performers. Faced with neglect and systematic devaluation we now have very scanty evidence for the way in which these Dastans were compiled and performed. Even basic things such as movements, gesticulation, stage setting are wholly unknown. The current performance is therefore merely an exploration of an Art form which, astonishingly in a culture where poetry was regarded as the supreme art, was considered by some to be of a higher order than poetry itself. Dastangos were supposed to be a repository not just of language, common speech as well as literary, but also of social mores, craftsmanship, and all other forms of knowledge. The Dastangos of old performed in an oral culture where memory, sound and directness were much prized. As modern actors we neither have skills to memorize whole daftars, nor the inventiveness to do spontaneous and extempore improvisations which are the hallmark of oral performances. Mahmood Farooqui is a self-trained actor and performer whose most recent foray into acting consisted of a role in Mahesh Dattani’s English film, Mango Soufflé. Initiated into theatre as a schoolboy, and as stage manager, by Mohan Maharishi, former director of the National School of Drama, he directed several plays at school and college, and prepared for the final entrance workshop of the NSD, before founding his own amateur theatre group called Dastak Theatre. After completing his M Phil in Indian History, Mahmood went to Mumbai and performed in IPTA’s Aakhri Shama and the Company Theatre’s Hindustani presentation of Rosencratz and Guildenstern are Dead. Earlier this year, he was given a Fellowship by Sarai, CSDS to work on the Dastan-e-Amir Hamza. Danish Husain has done theatre with the best names in the country – Habib Tanvir, M.S. Sathyu, Barry John, Rajinder Nath, Sabina Mehta Jaitley, Aziz Quraishi, et al in a wide variety of roles. His latest assignments include a play called Raja by Rabindra Nath Tagore and a movie, Losing Gemma, by Granada Productions for a British TV Channel called ITV. He’ll also be performing at Bonn Theatre Festival in May 2006 as part of Habib Tanvir’s Agra Bazaar troupe. Besides being an accomplished actor Danish is a poet and a writer, whose work has been published across a cross-section of media, including Tehelka and other journals. He is a member of few collaborative blogs and a writer’s group called Wriyaz supported by the British Council. Danish holds a Master’s degree in economics from the Delhi School of Economics and an MBA from the Faculty of Management Studies, University of Delhi.